Moscow, RU - New Way®, a leading manufacturer of garbage and refuse trucks in the United States, recently made its debut on European soil alongside their first European dealer, The Atlantic Group. 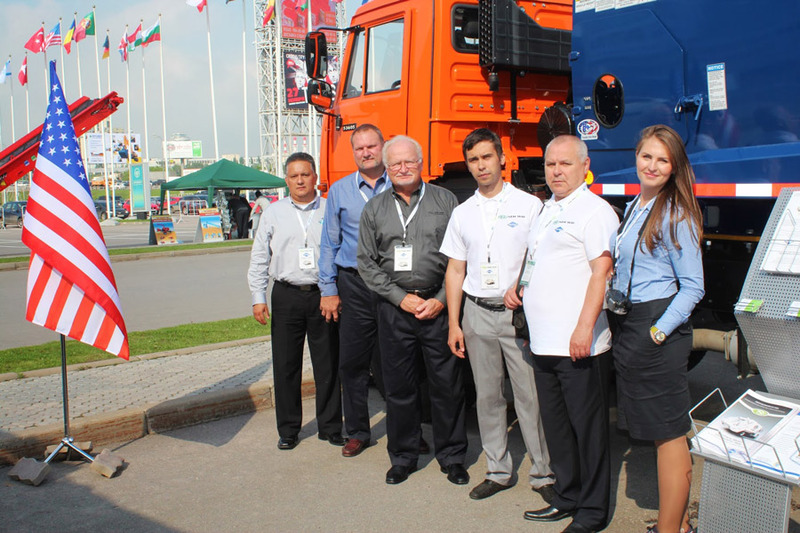 The Scranton, Iowa refuse truck producer and Moscow, Russia dealership exhibited as part of the International Exhibition for Waste Management, Recycling, Renewable Energy and Environmental Technology known as WasteTech. The show was the Atlantic Group's first experience exhibiting the company's trucks after forming a partnership with New Way® earlier this year. Both end users and municipalities were represented at WasteTech, with interest in New Way® trucks being expressed from as far away as Dubai. The Atlantic Group's Kate Alekseeva received requests for quotes on virtually all models and sizes of rear loading trucks during the show. The dealership mounted a previously-purchased Cobra™ rear loader body unit onto a Russian-made Kamaz chassis for display at the show. This unit will be used as a demonstration truck throughout Russia, allowing prospective customers to view and operate a New Way® truck body before making a buying decision. "WasteTech was a great way to introduce New Way® to Eastern Europe," said Mike Dryden, New Way®'s Director of International Sales. "Customers and prospects of The Atlantic Group were able to see firsthand all of the features that make New Way® so popular in the U.S. waste industry." (L to R) Hubert Gutierrez, Export Manager for Perkins Mfg, Carl Pezold, New Way® Field Service Engineer, and Mike Dryden, New Way® Director of International Sales, stand with Alexey Samoletove, Regional Development Manager for The Atlantic Group, Michael Kurochkin, Manager Atlantic LLC, and Kate Alekseeva, General Manager of The Atlantic Group for a photo with the Cobra refuse truck displayed during WasteTech.